IDFC Mutual Fund is coming out with a New Fund Offer on 9th April namely IDFC Equity Opportunity Fund. The Fund will be a 3 year Close Ended Fund. The Fund will aim to invest in Small and Mid cap fund. IDFC Equity Opportunity Fund will be investing in small and mid cap and hence I would categorise the fund as a High Risk High Return fund. IDFC, as a Fund House, enjoys a good reputation of investing in mid cap space. The Fund will limit its size to 125cr as the Fund House feel this will ensure investors make early returns in the next cycle. The Fund is a Close ended fund. Fund will have a diversified portfolio of 60-80 stocks. The key for diversification is to manage liquidity/risk considerations and play across sectors. The most interesting aspect of this NFO is that there is NO Growth Option and there is COMPULSORY DIVIDEND option. The 3 year lock in allows the Fund Manager the to buy and hold stocks and not worry about the daily NAV as well as any Redemption Pressures. 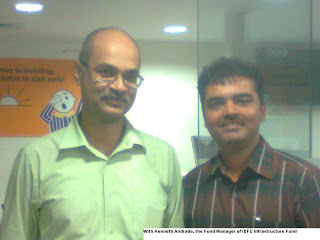 The Fund Manager Kenneth Andrade has gained reputation of identifying small caps which has the potential to become Larger Mid Caps. Some notable examples being Page Inds, Kaveri Seeds among others. Star Fund Manager Kenneth Andrade besides managing the highly successful IDFC PREMIER EQUITY FUND also manages like IDFC 50-50 Equity Fund, IDFC Infrastructure Fund, IDFC Equity Fund whose performance is nothing to boast of. Small Caps and Mid Caps tend to be highly volatile and investing in SIP way would be the BEST method to negate the volatility but sadly this NFO does not give this option as this is a Close ended fund and hence no SIP option. IDFC is advertising this Fund as “an opportunity presenting itself after a decade”. Sure opportunity is there, but why should I do go for a Close ended fund when I can do the same with a Open ended fund which I can always switch if the Fund is inconsistently performing poorly which i cannot do with a Close ended fund as this NFO is? The Fund is for investors who are ready to take High Risk in pursuit of High Returns. Even then, I would prefer investing in proven small cap funds like Religare Mid n Small Cap Fund, Mirae Asset Emerging Bluechip Fund, DSP Small and Mid Cap fund, etc rather than risking some more by going for a NFO, that too close ended. My advise.........AVOID. If you still want to invest in this fund, ensure that your expose is limited to 5% of your overall portfolio.